In its second year, the American Civic Collaboration Awards will continue to highlight outstanding efforts of civic collaboration making impacts in local, national and youth communities. Awardees and finalists were celebrated at the National Conference on Citizenship in October 2018. Nominations closed on July 13, 2018. Finalists were announced in August. Missed this year's nomination period? Sign up for our email list to be notified of next year's deadlines. Read more about our criteria below. 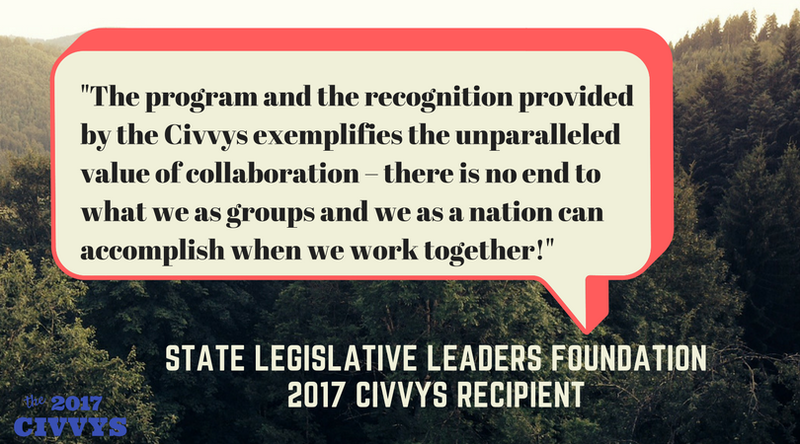 The Civvys celebrate best practices in civic collaboration that put community and nation before party, ideology and narrow interests. In its inaugural year, the Civvys highlighted outstanding efforts of civic collaboration making impacts in National, Local and Youth communities. Since this is an election year, the 2018 Civvys will include a new category, “Political,” focusing on campaigns and leaders that make collaboration and civility a core part of their message and operations. Collaborative practices. To what extent does this work use civic collaboration best practices to achieve results? Impact. Who has this work had an impact on, and in what ways? Scalability. Is this work something that can easily be expanded to have a greater impact? Is it something that can appeal across geographic regions, or be used to effect change in other civics topics or challenges? Meet the winners and finalists of the inaugural year of the Civvys.